Following on from my column last week covering the home broadband market, I analyse another area in which BT has expanded in to. The competition is as fierce as ever in the Premier League this season. Clubs are making the most of the monumental amount of money they receive from television in order to bolster their squads. The two main companies responsible for broadcasting the games domestically, BT Sport and Sky Sports, have once again locked horns in their off-the-pitch battle for subscribers and viewers. Sky has been the dominant broadcaster of the Premier League since its inception in 1992. In recent seasons BT Sport has entered the market, challenging Sky’s monopoly. With the new season now underway, I will assess YouGov BrandIndex data to see which brand currently has the edge. Both companies have invested heavily in advertising and signing-up the most high-profile people from the world of football to help front their spots across a variety of mediums. BT has also brought on-board big names, including Jose Mourinho, Gareth Bale, Rio Ferdinand and Paul Scholes, to tempt viewers across to the channel. Sky Sports has responded with its campaign highlighting it has ‘the games that matter’ highlighting that it had 49 out of the 50 most viewed game last season. It has also promoted its breadth of European football coverage through an advert including David Beckham. So what impact have these adverts had on consumers? 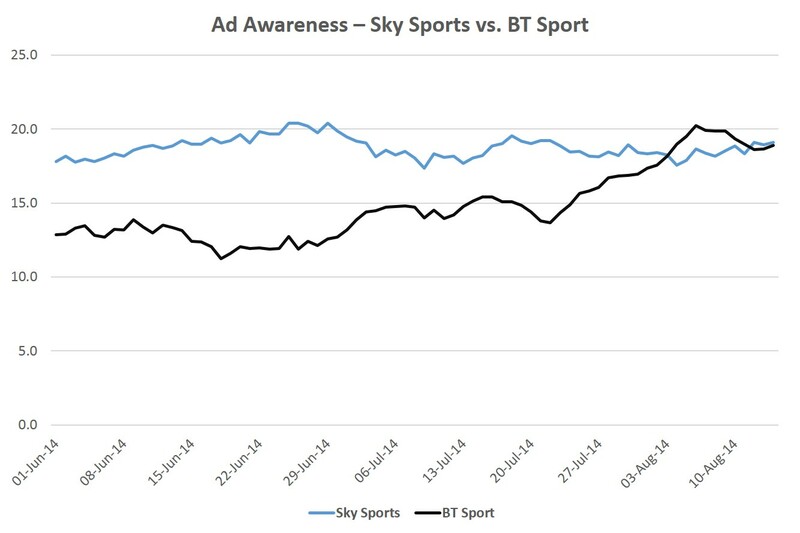 We can see that over the close season BT has had the most dramatic rise in our Ad Awareness metric. The internet provider and broadcaster rose from a score of 12.9% at the start of June to a high point of 20.2% at the beginning of August, when it surpassed Sky Sports for the first time this summer. While Sky Sports hasn’t seen a similar spike in its metric, it has had a higher average rating than its competitor (18.7% compared to 14.8%). One key area in the battle is the issue of whether consumers find the rival broadcasters good value for money. Given that BT is currently still offering the Sport channels for free amongst its broadband customers, it’s perhaps unsurprising that the public find its price to be fairer. 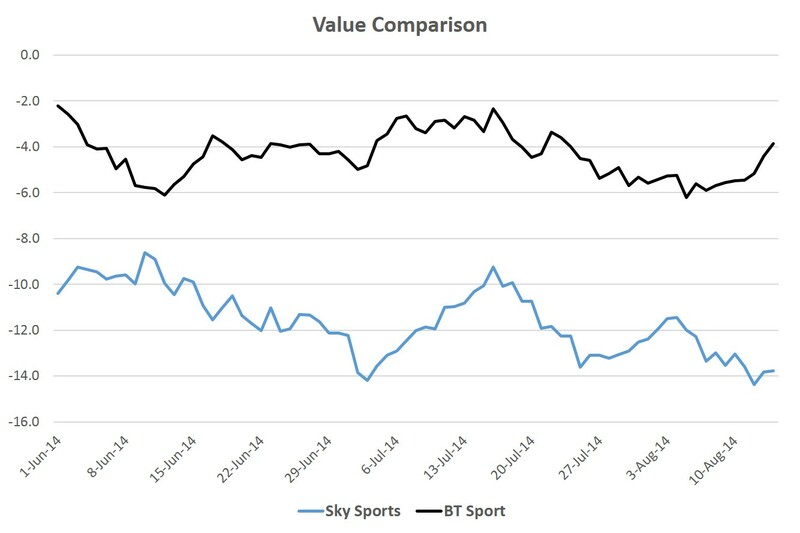 Although both currently have negative ratings and have done for some time, since the start of June BT averages -4.3 compared to -11.6 for Sky Sports. Sky Sports has been the dominant player on the field for some time but it appears that BT Sport is finally providing the broadcaster some stiff competition.